A fundamental change in approach or underlying assumptions. Wow, that really is enough words for this post if you think about it. I don’t need to write anything else. Just read that sentence over and over to yourself and consider how powerful it is. What is your approach? What are your underlying assumptions? Be honest. Change in approach. Change in underlying assumptions. It may be hard for some people to comprehend what all of that even means. Sometimes we might find ourselves in a situation where everything seems hopeless. Everything is falling apart, and there is nothing we can do about it. Maybe you lost your job, got divorced, or are just plain tired of existing in a world where it seems like everything is going well for everyone except for you. Maybe you keep finding yourself in situations that go sideways and you just can’t figure out why. When you’re down in the mix of the chaos it can be really hard to see which way to go or to know what to do. This is where that change in approach and underlying assumptions comes into play. Another time I went through some pretty high level marketing and entrepreneur courses on the internet. I was stoked. When I was done with the courses, I finally would be in the know. I would know everything I needed to know to make all of the dollars. Watch out, bank account, you’re about to get flooded! Even though I would go on to make at least a couple of half assed attempts at success, I never truly understood what I needed to do. I would never change my approach or my underlying assumptions. I just simply didn’t understand. Ego or some filter inside my brain just wouldn’t let me sit down and honestly look at the situation and see what needed to really change or what action I really needed to take. Even though I felt good about what the magic-millionaire-internet man had taught me, it would do me no good if I had no understanding or no ability to look at myself in an honest way and make a real shift in perspective and behavior. Maybe you are unhappy. Maybe you think you have nothing. What are you basing that on? Are you sitting on your couch in your 4 bedroom, 3 bath house with your cellphone in your hand posting memes on instagram about how you wish something would just go your way for once? Put the phone down, it’s time to try to shift some paradigms (I think I just made up a slogan). It’s time to work on changing your approach and underlying assumptions. Let’s try to think through a specific example to illustrate my thoughts. Your neighbor has a super sweet riding lawnmower. It’s got a place for his beer and even a port he can plug his phone into so he can listen to podcasts while he mows his yard and drinks beer. He also has a super sweet, gas powered edger that practically does the edging job for him. Everyone is always telling him his yard looks great. He’s always winning yard of the month. You have a push mower someone gave you that has duct tape holding the air filter in place. Forget about listening to podcasts. Whenever you turn the mower around the mower handle gets caught on the headphone cord and pulls your earbuds out of your ear with a violent force that sends you into a fit of rage. Nobody ever tells you that your yard looks great. If you could only afford one of those mowers like your neighbor has, you’d win yard of the month every month. It’s pointless, you may as well not even mow your yard. So you don’t even bother, and you put off the job. Since you put it off the grass ends up getting too tall and you end up with a job to do with your little duct tape hand me down mower that’s 10x harder than it should be and takes you 10x longer than it should. To make matters worse, since the job is now longer and more difficult, you end up thinking about how terrible it is the whole time. Nothing but negative thoughts going through your head about how you shouldn’t have to be doing this. You should be riding in style and listening to podcasts with a cold beer. 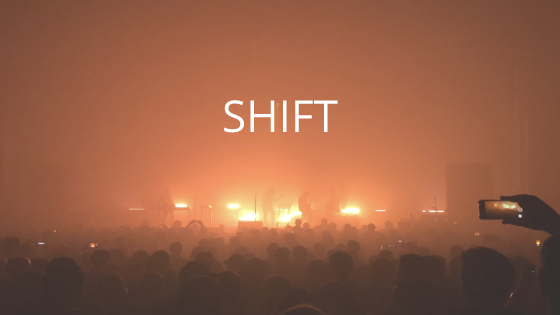 Enter the shift. All of this is completely avoidable. You have the tools to do the job. You just need to do it with what you have. Literally everything else is made up in your head. Your approach and your underlying assumptions. What if you were grateful to just have a lawnmower to do the job with in the first place? Even better, are you grateful that you even have a lawn to mow or do you assume that you just deserve all that stuff so it’s irrelevant? What if you decided that you were going to challenge yourself to do the best job you could possibly do with your little duct tape lawnmower? That however long it took, you’d do a better job than the guy with the fancy shmancy mower? Even better, what if…. What if you stopped worrying about him at all and just did your thing? It seems simple, but some of us have some serious blinders on and it’s hard to look at things in an honest way. We can get so wrapped up in things that we think are important, but they really aren’t. Let’s try to consciously take a step back and look at the situation and ourselves in an honest way. What can we change about our approach and our assumptions that can make us better people, or more importantly more happy? Are we willing to make that change? If not, why? Shifty fella aren’t ya? The tricky parts are identifying what paradigms are shaping ones life in the first place and how do they need to shift to get better outcomes. Haha! Yes, that is very tricky, but I think once we figure them out it can be very eye opening. Thank you for reading and commenting!